A dust proof, leak proof, box marked "desiccated specimen container" was found at a flea market. 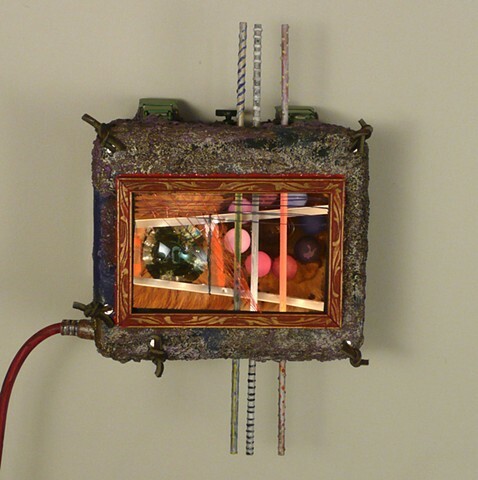 I cut and window in the front and created an assembly inside with hand-painted wooden balls, metal troughs, wire, some rabbit fur and a 1930 railroad nail. I positioned a short rope light and a condenser lens from an old filmstrip projector over the nail head so you can read the number "30" easily. The outside had been covered in paper that had weathered away so I followed the worn pattern by adhering pumice medium, which I later painted bronze, on the bare metal and painted the paper part shades of purplish blue. Three wooden dowels pierce the piece vertically.